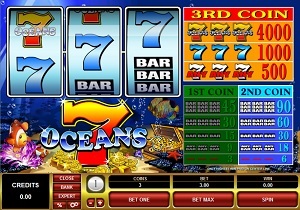 7 Oceans is a classic online video slot game from Microgaming that has been released in November 1999. This online video slot machine game has 3 reels and 1 pay line. The theme of 7 Oceans is, as its name suggests, is based on an underwater adventure where you can find not only colorful fishes, but also sunken gold riches! Several online slot players love playing this classic slot machine game as it brings out a genuine impression of a real land-based casino slot machine in every way. It may not look very interesting for a lot of players at first glance, but once they got to play with it, they admitted that they have enjoyed playing this classic yet addicting slot game. Microgaming online slot games can be available in 2 formats. The first one is the download format, which is actually preferred by most players. The second one is the Flash or browser-based version which means there is usually no need to download anything at all. Nowadays, a lot of online slots players would love to play for free first (instant play) whenever they want to try out a slot game for the first time, so that they can assess if they like that game enough to spend real money in it. Good thing that Microgaming caters to any type of slot player, and 7 Oceans is one of their many slots games that can be played for free or real money without downloading anything! Did you know that the 7 Oceans in the world comprise of the North and South Pacific, North and South Atlantic, Indian, Arctic and Antarctic oceans? It’s cool to know this small trivia while playing this particular slot game, huh? Even if you don’t know how to swim or you’ve never been to any of the actual 7 oceans, you can still go for the sunken riches that the 7 Oceans online slot game has to offer, by simply betting a mere 1 up to 3 coins when you play! The 7 Oceans online slot machine game features 3 reels and 1 pay line, no fancy stuff to remember, the maximum regular payout you can get is 4,000 credits, and you can have the chance to win the Jackpot if you bet 3 coins per spin! When it comes to the no-download or instant play version of Microgaming, they are pretty decent as compared to that of what other software providers seem to offer. They have done a great job in converting even old yet still extremely exciting slot games to the no-download version. Microgaming provides a very vast selection of games and each of them has high-quality graphics and realistic sounds that perfectly complement the theme of their games. 7 Oceans looks like one of the many traditional slot machines that you typically see in land-based casinos. Since it is essentially a no-frills type of slot game, 7 Oceans has been designed to have a genuine casino ambience with matching sound effects, which makes you more convinced that you are in a real casino playing an old-school slots game. The casing of the reels includes the reels, buttons and the paytable. The icons or symbols used follow the theme of the game as it includes bars and sevens. 7 Oceans has dynamic reels that change depending on your coin level. When you spin the reels and hit a winning combination, the amount you’ve won will be briefly highlighted on the paytable, which allows you to easily see the exact amount you’ve won (not all classic online slots actually have this feature). The overall graphic design of 7 Oceans displays the deep ocean with some brightly colored starfishes, clownfishes, anemones, royal angelfishes, and treasure chests overflowing with gold coins, which definitely brightens up the night-blue color scheme. Since it is a pretty straightforward online slot machine game, 7 Oceans does not have too much sound effects. When you spin the reels and hit winning combinations, you will hear the familiar sounds of a traditional 3-reel slot machine game in land-based casinos. There are no regular card deck symbols available in the 7 Oceans online video slot game. The regular symbols that you will find in the 7 Oceans slot game are the 3-Bar, 2-Bar, 1-Bar, the Blue Seven, and the Seven Oceans symbol. There is no Scatter Symbol in the 7 Oceans online slot game. Since 7 Oceans is a traditional, old-school 3-reel slots game, there are no bonus features in this game. 7 Oceans has 3 reels where you may bet on 1 pay line only. The minimum bet is 0.25 and the maximum bet is 5.00 per line. You can wager from 1 up to 3 coins per pay line. Thus, the minimum amount you can bet is 0.25 and the maximum amount you can bet is 15.00 per spin. Please take note that the amounts mentioned are in Pounds, but they will remain the same if you choose to play in US dollars, Euros, or Canadian dollars. Also, for every coin that you wager, you will enable another pay line. You will be paid out for winning combinations on enabled pay lines only. Thus, if you do not bet the max of 3 coins, you do not qualify for the Jackpot win should you manage to get 3 Seven Oceans symbols, or 3 Blue Seven symbols, or any 3 Seven symbols that appear on the pay line. 7 Oceans is not equipped with an Autoplay function.